Sharing some information on behalf of my Deanwood neighbors. 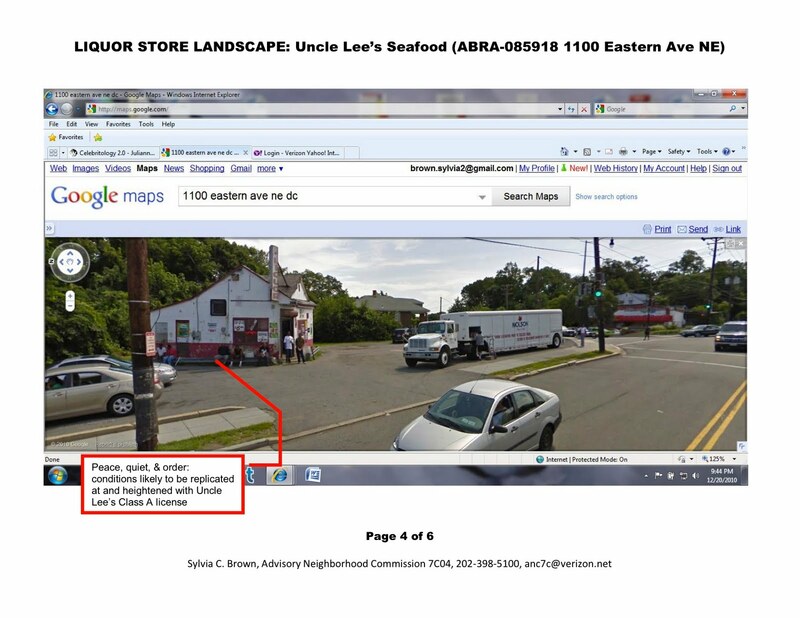 They have been fighting against Uncle Lee's Seafood petition for a Class A Liquor License since December 2010. Neighbors have met with both store and property owners and attended ABRA hearings, all to no avail. 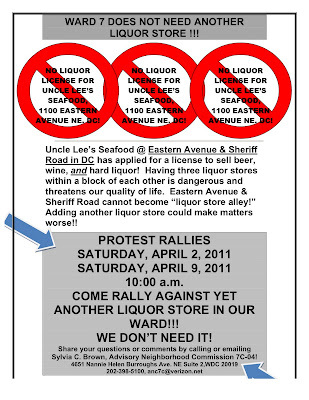 They are now planning a protest rally for April 2, 2011 at Uncle Lee's (intersection of Eastern, Division and Sheriff NE) to bring more attention to the larger Ward 7 community. 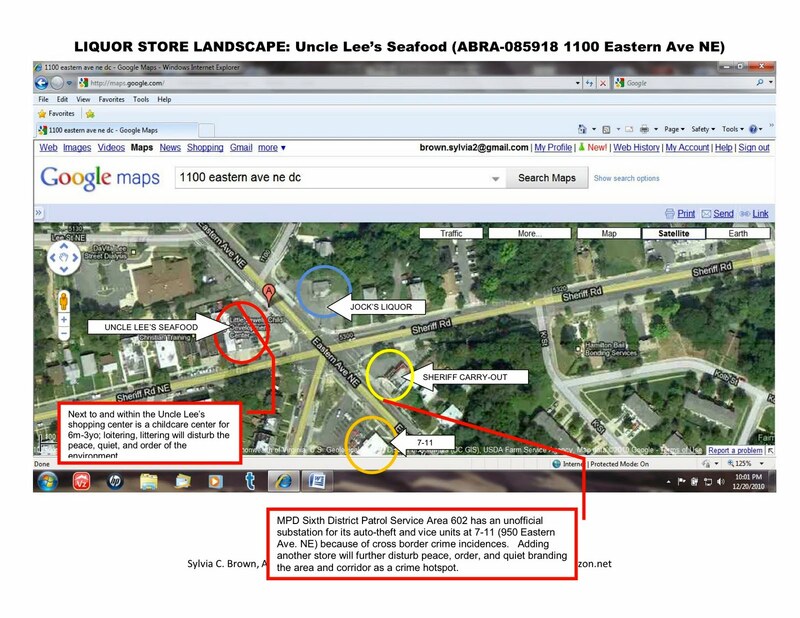 As you can see in the photo below, there are already two liquor stores on two corners on the Maryland side of the street. 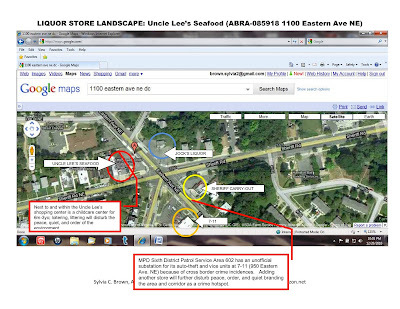 Ms. V wouldn't be opposed if Uncle Lee's was going to upgrade their store to look more like Cornercopia at 1000 3rd St SE (Near Southeast). 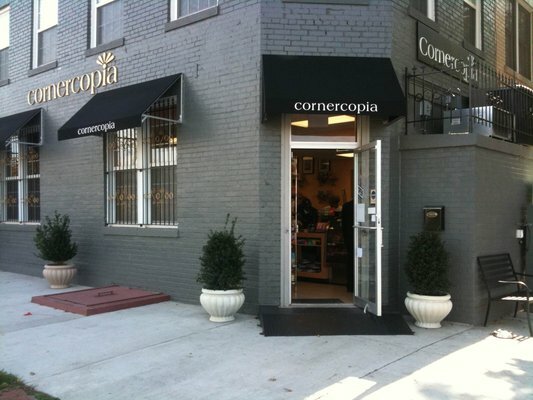 Doesn't Cornercopia look like an inviting neighborhood serving market? 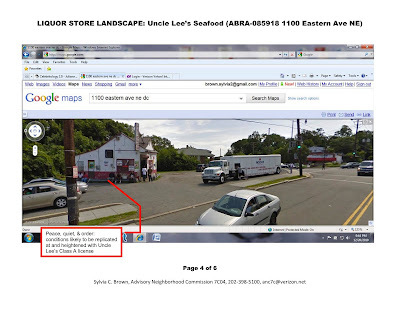 Yet, instead we'll more than likely get something that looks like the liquor store across the street in Maryland. 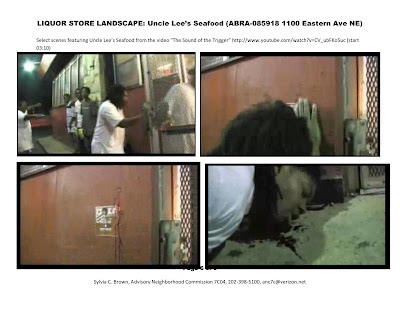 Which attracts ignorance as displayed in this music video that was recorded at Uncle Lee's with permission of the owner. 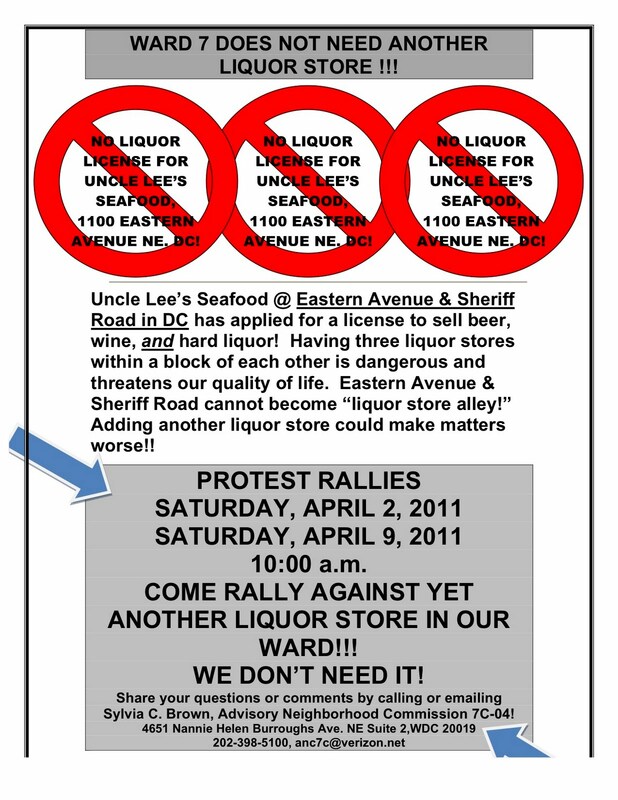 We do not need another liquor store in our community! We have too many already. Ms V urges you all come out and support our Deanwood Neighbors...what happens to one part of our Ward, affects us all. Thank you for supporting! What happens in one part of the Ward affects the entire Ward! Maybe I am not getting this, but doesn't this have to go forward through the ANC for approval? Anonymous, thanks for your question. The ANC gets notification about liquor licenses and votes whether or not to protest the liquor license. However the decision to grant the license is with the District's Alcohol Beverage Control board. In its decision the seven-member ABC board considers the applicant's impact on peace, order, and quiet. With enough evidence from the protestants the board might not grant the liquor license. The ABC process though is very onerous on the residents and is heavily weighted toward the business. Neighbors will have to work hard to have solid evidence of Uncle Lee's negative impact on peace, order, and quiet in order to stave off this encroachment. I hope Aysha and you will join us on April 2 and 9 at 10a at Uncle Lee's. Just as important we'd love to have you at the protest hearing on Wed., April 13, 4p, 2000 U St. NW (Reeves Center)! I'd rather have a Cornucopia like establishment any day than what is being proposed by the Uncle Lee's establishment. With that being said, I'd like to thank you Ms. V for putting this out there concerning our constant battle against another liquor store being added in our community. Your support is very much needed and even more appreciated. I hope to get a chance to meet you at the protest. Thank you Ms. V for this wonderful post and spreading the word to the larger community. We appreciate your support!